Even when IT security tools are implemented, you may not be able to review and evaluate the policies and data you care most about. Out-of-the-box IT security reports don’t usually cover unique company-specific requirements. You need reports that are relevant to your security team and admins, whether you’re a Managed Services Provider or the CIO. Reporting is a crucial component of your privileged account security program. Security teams must be able to see at a glance which policies are implemented and what exceptions there are. Auditors will need to know who had access to what, and why. Customizable reports give greater control over what data is returned and lets you dive deeper into your Secret Server usage. 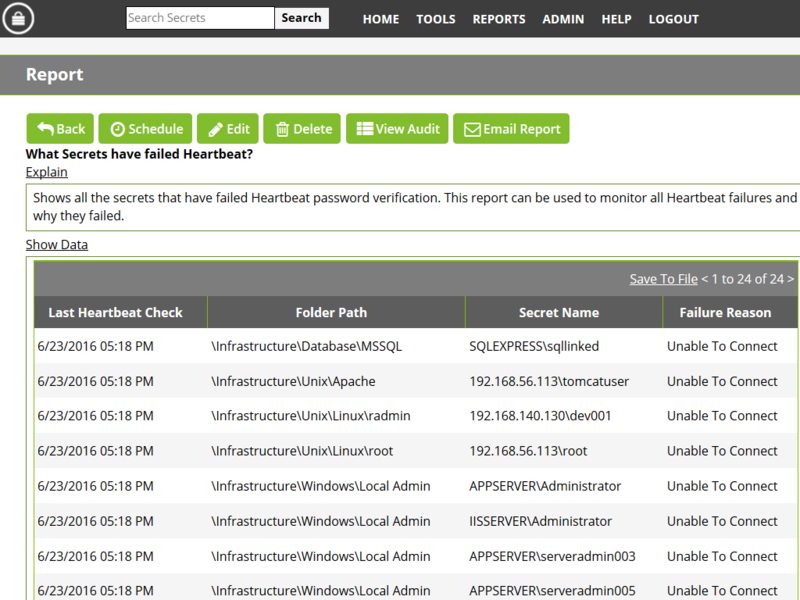 Secret Server comes with dozens of out-of-the-box reports to assist with security, system health, and compliance. If a report you need isn’t there you can easily create a custom report with database queries. Reports can include charts and rollup graphs for visualization and can be scheduled to go out to the appropriate team regularly. TRY CUSTOM REPORTS NOW. Our free trial is fast to install and easy to use! Start your 30-day free trial of Secret Server using the trial form. Secret Server’s reports are SQL based, which provides a standard and easily testable way to retreive data from the database. Reports are protected through RBAC so you can limit which users can create or view reports. See this KB article for instructions on creating custom reports with dynamic parameters, reporting schema, and how to schedule reports.